On the plus side who doesn't want to still be reading about HFW in May? An early morning downpour made for a rather soggy breakfast, but by the time I skidded into view of Hull City Hall (blaming the roadworks for my tardy appearance) I was under the balcony rather than on it. Oops! By this time, the sun was shining and the blue skies made for a much better first photograph of the day - it could only get better. All the things a blogger needs for a busy day of Fashion! My definition of better involved a well dressed wrist, portions of Thieving Harry's coffee served with orange chocolate flapjack, a programme for the day and making sure I had plenty of room for my notes! The Catwalk Finale was presented by Nineties Boy (Luke Chambers) and Keeley Donovan from Look North, with added glam and sparkle provided by our very own Hugh Rice and Celebrity Guest Stylist and Make Up Artist Lewis-Duncan Weedon. Luke and Keeley make a start with introductions all round and you can just spot Lewis-Duncan waiting to make his entrance! Then we stalled... 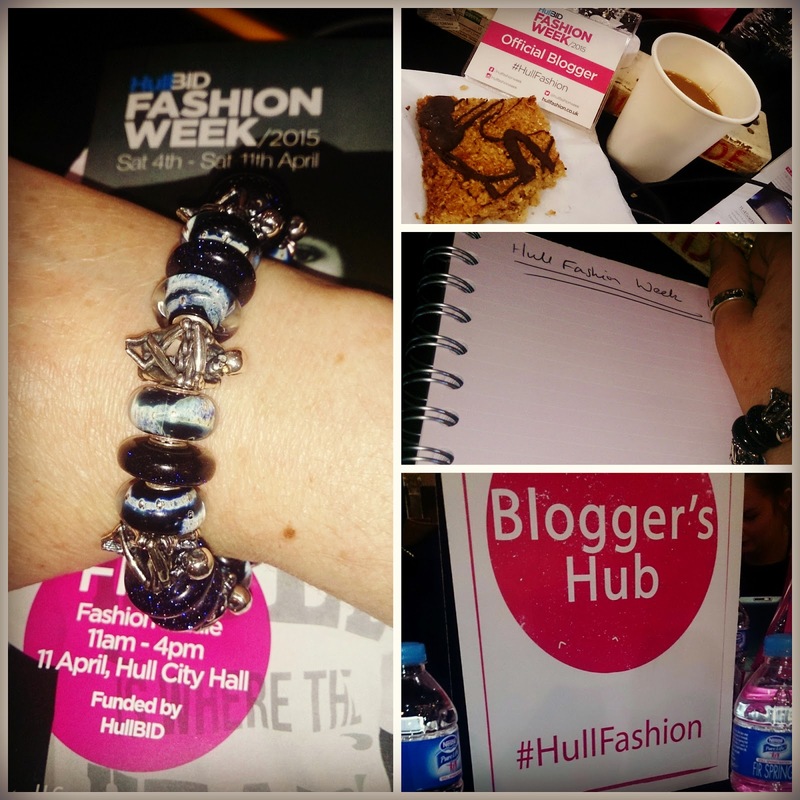 I'm still not quite sure why we got off to a late start but we soon got back on track, in the meantime it gave me chance to catch up with the lovely #HullBloggers - a great group of folk who have also been working their way through HFW for your reading pleasure. Yes, yes, it *always* gets this messy, er I mean, busy at the Bloggers Hub! No shoe fetish?! Wait, what am I doing at a Fashion Event? Oh I wear clothes, phew! Even the Mascots joined in the Catwalk fun with a "Walk Off" between the two! We had boxing tips with Tommy Coyle demonstrated by the audience on stage, throwing their first (and hopefully only) punch of the day... I certainly didn't hear about any casualties; although I may have accidentally elbowed someone in the coffee queue later on! Festival Wear was a popular catwalk, unsurprising as Hull hosts a broad range of festivals throughout the year, outfits here catering to our ideal of sunny summer festivals, with less for the muddy field variety but I guess there are only so many ways you can style a variety of wet weather gear and wellies! I think this one was popular with my fellow #HullBloggers as there were a lot of photos being snapped during this catwalk! Then it was time for a masterclass in Upcycyling old outfits! First we had a mini catwalk of the outfits and then our guest presenters took us through each look and how it had been created... you can certainly get a lot of mileage out of one pair of jeans. I love this element of fashion as I used to make a lot of my own clothes (badly sewn) although my Grandma's curtains never did make it back on the rail (Another True Story) as they were a more permanent donation to my wardrobe! Guest presenters talking us through the concept and each outfit. 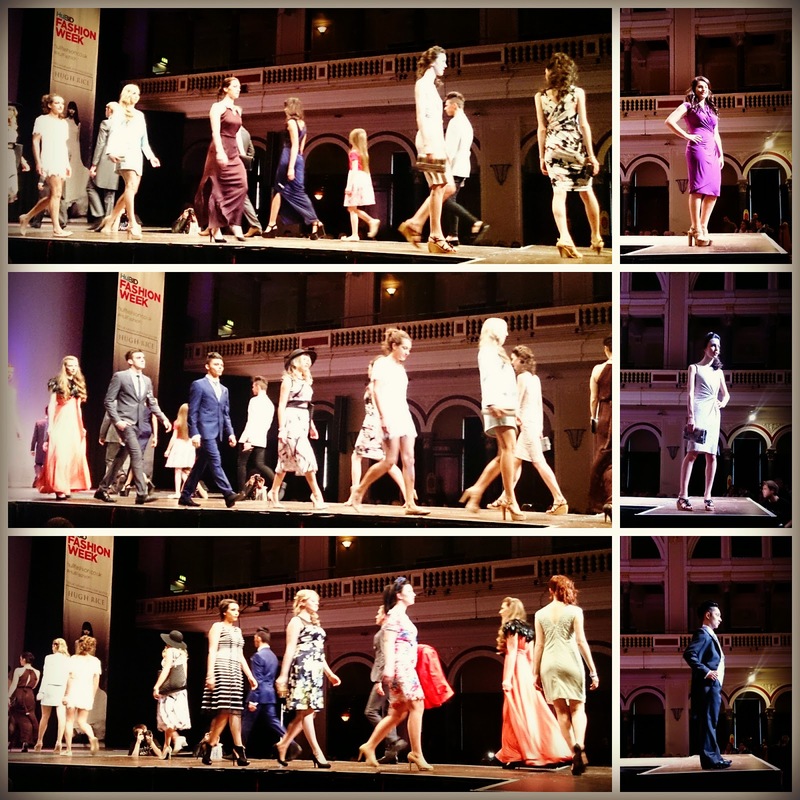 Next catwalk was Celebration and can I just say from the start that's it's impossible to take a photo of a sparkly dress, especially a wedding dress with a mobile phone... this is where my trusty Xperia Z let me down; I took 6 photos of ethereal ghost like figures before giving up, take my word for it though, both the dresses and the women modelling them were lovely! One of the elements of the day I really enjoyed was the Hair Piece, no, not an actual wig, but the segment of the day where HFW looked at hairstyles with H.Air Blow Dry Bar... Charley over at Rambling of a Beauty Blogger and another model had quick styles created on stage and Charley chatted about blogging from the stage with Lewis-Duncan. 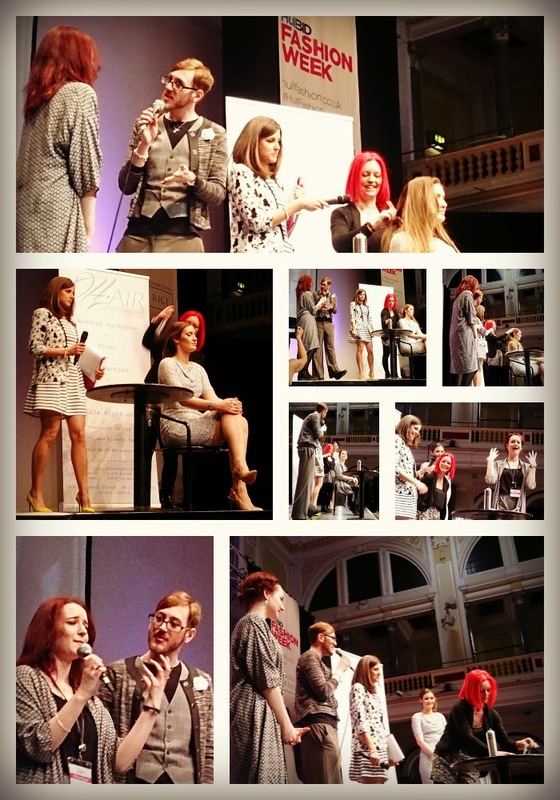 All about Hair, Blogging and Fashion! 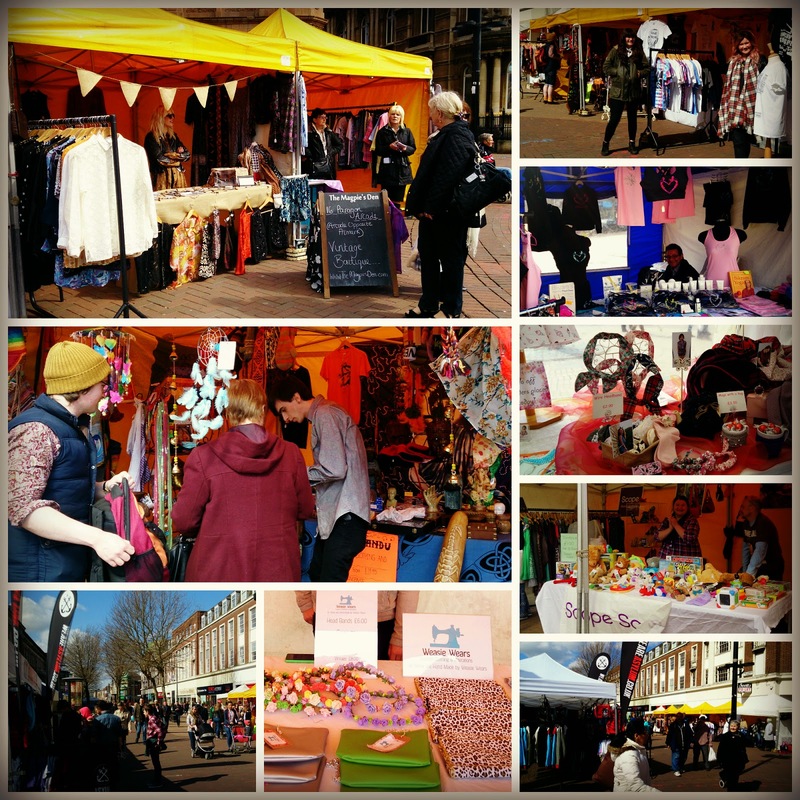 I slightly miscalculated how much time I had free at this point, as realising I was hungry I decided to nip out for a bite to eat... only I got sidetracked by the lovely market stalls outside, and guess who forgot to get a sandwich? 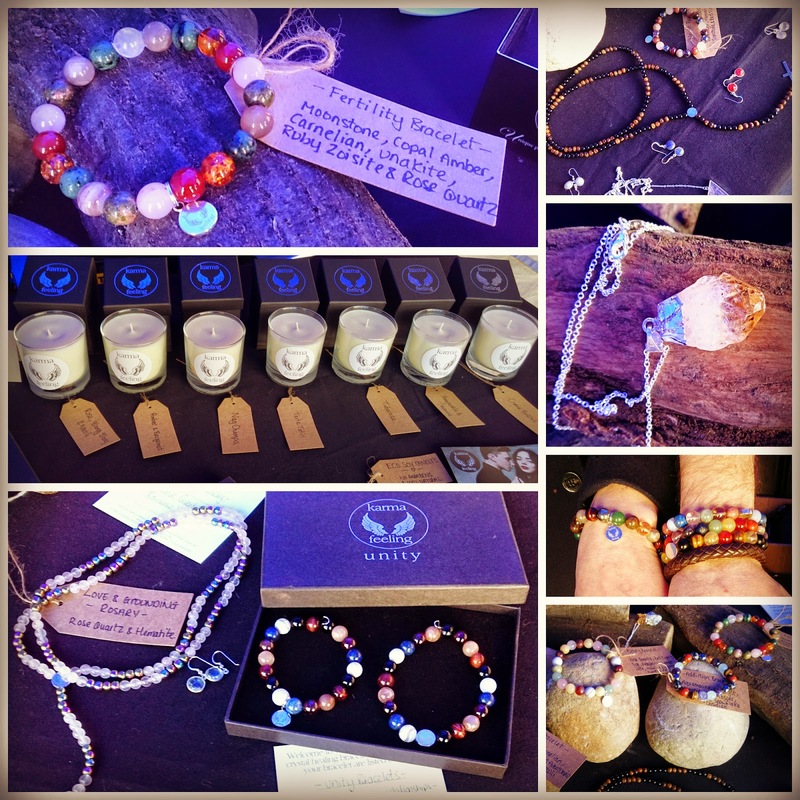 Actually I blame meeting Karma Feeling for the first time, well who would have predicted that one... the jewellery blogger getting sidetracked by jewellery?! When I stopped drooling over the lovely bracelets and candles and made my way back into the main hall I'd missed a Catwalk, but was able to catch one of my favourite outfits of the day, a simple style but I've always been a sucker for that dress and boots look... am I finally fashionable? Just to give you an idea of how popular the shows were, this is a pic I snapped from the stage end, HFW Finale had a great turn out this year and it certainly felt busier all day. #HullBloggers kept on working, I think a few of us forgot to eat properly during the day - next year I think we need a food delivery to keep us going! The audience didn't get off lightly either as there was a quick lesson in how to work the Catwalk, I wonder if we'll see some of these coming through in future Hull Fashion Week events? 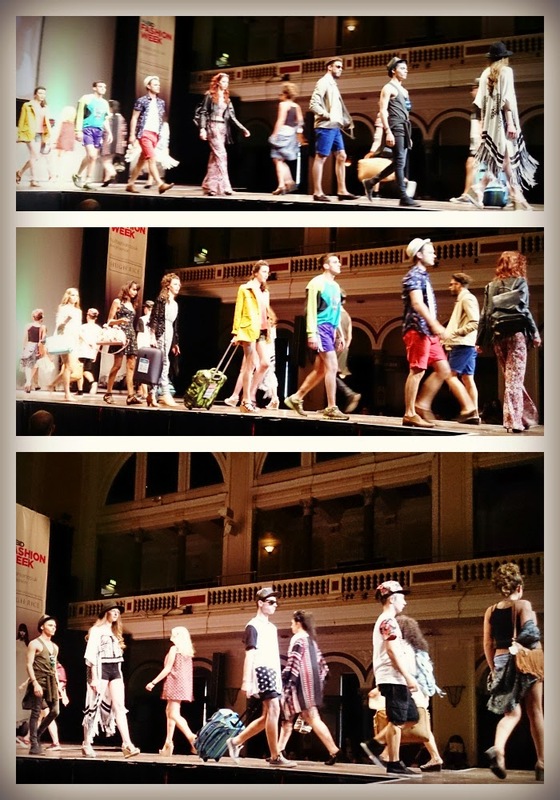 Future HFW models get a class in how to work the Catwalk! I've saved the very popular catwalk and segment that was by Paul Spence and the Hull Workmen's Calendar 2015 models for last, as a special treat for those of you who've scrolled down this far... I can't think why this generated so much buzz, but it was all for a good cause! back in the limelight to help launch the charity Paul. 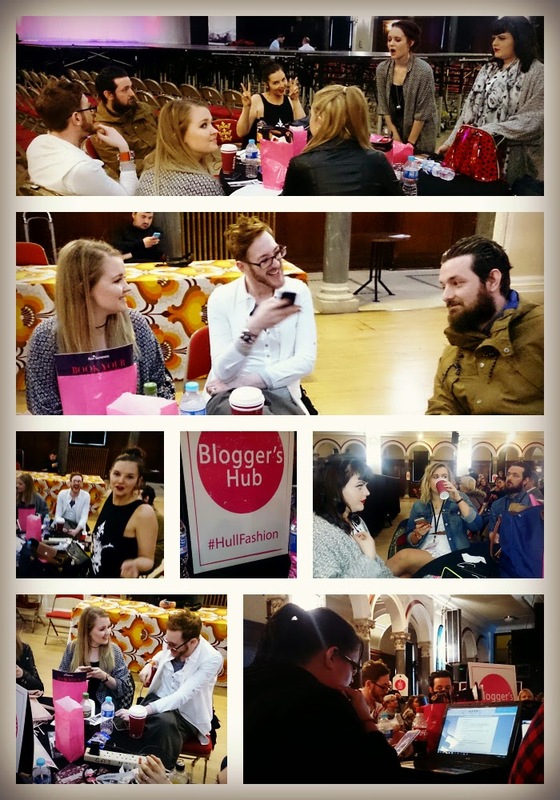 Hull Fashion Week certainly kept the #HullBloggers busy - given that I've gone collage crazy I had to do a little montage of them too! Mostly some of the more fun shots taken at the end of the day as we were quite busy during the shows.. Lewis-Duncan gets everywhere... by the way did you know he's an adopted #HullBlogger - fits in just nicely! So for me and the #HullBloggers it was time to pack up and indulge in a little shopping, then for me it was time to crack on with the rest of that alphabet!! Roll on Hull Fashion Week 2016! or a whatever falls out of your wardrobe person?